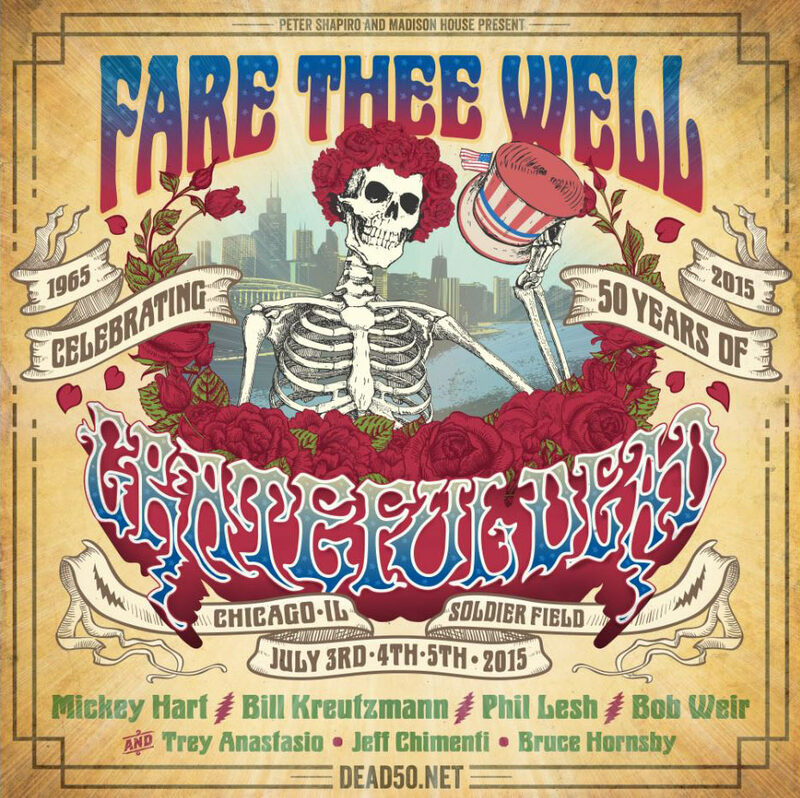 The surviving Grateful Dead played a mass of reunion concerts over the summer of 2015, first and less successfully in California but then in full flavor over Independence Day in Chicago. The shows sold out. The ancillary cover-band hanger-on concerts sold well. The Windy City, by all accounts, filled up with Deadheads. I will pass over the dangers to society that the hippie way of life brings with it — widespread drug addiction, rising incidence of infectious hepatitis and venereal diseases, danger of outbreaks of polio and typhoid. I will also pass over the false and dangerous consequences of the hippie “ideology,” such as their antinomianism, their hostility to authority, their sexual looseness, their leftist leanings. All these dangers, while real enough, are of a secondary order; primary in criticizing the hippies is their doctrine of love, upon which they so pride themselves. Love, for them, is an orgiastic feeling in which they wallow in self-indulgence. This kind of love is corrupting both to the cultist and those upon whom it is lavished. Love, in any true sense, does not arise spontaneously as dumb feeling, to lose itself in a turbid morass of love mystique. Love is concern and commitment in its ultimate dimension. Not he loves his neighbor who sings love chants and invites the “experience of love,” but he who understands how to share his neighbor’s hopes and concerns, and to support his neighbor by helping to erect personal and social protections for his neighbor against the sinful self-aggrandizement of men in society. Love as feeling without doing rots and spoils; and surely it would be hard to find anything so rancid as the love-unction of the hippie love mongers. And now we come to the final point. It is not innocent to pretend to an innocence impossible for man; unacknowledged sinfulness is a deadly poison, ruinous to the individual and to society both. For unacknowledged sinfulness means a refusal to see oneself in realistic perspective; it means a loss of the sense of ambiguity in life, of its hopes and possibilities, indeed, but also of its perversions and frustrations. The hippies, with their paradisal naiveté, would encourage this illusion of primal innocence in us and in mankind, an illusion so appealing that we are forever falling into it even without encouragement. The hippie spectacle is a kind of Medusa head; but it will turn those who gaze upon it without adequate protection not into stone images, but into fools and simpletons. Saint Augustine somewhere says very much the same thing. And when Augustine and Lenin agree on something, it is surely a something well worth taking note of. No doubt it is. Still, I hold to my opinions. Following Herberg, some say there is no more accurately descriptive name for the particular subset of hippies who are preoccupied with the Grateful Dead: Deadheads. I may be forgiven for my demurral. These people are still alive. Fortunately, the antinomianism and self-indulgence did not take, at least not in all cases. Turns out some of the hippies of Haight-Ashbury cleaned up and got good jobs. Many of these Deadheads are by now successful professionals: lawyers and businessmen, bloggers and bankers. I daresay more than few of them voted for Reagan. So the Grateful Dead had a reunion, and here I am writing about it. Professed socialism all to one side, the capitalistic character of these events, somewhat remarkably, predominated. The Chicago Dead shows were big US commerce: Don’t look now but the financiers were interested. I wonder if Jerry Garcia ever wrote a song about usury. The Reprise of the Dead was a big American business story. The Wall Street Journal covered it, ably and assiduously (with ample room for curmudgeonly dissent), starting with the announcement of the reunion shows in January  and following through with amusing analyses of the market for tickets, the choice of venues, and other angles on the business of the shows. Still not convinced that the Dead deserve my attention? Maybe I can at least sell the reader on curiosity. This case for the Grateful Dead is not without considerable gawping interest. So what of substance can be said in favor of band composed of the likes of the late Jerry Garcia, Phil Lesh, Bob Weir, Bill Kreutzmann, Mickey Hart, Robert Hunter and all the others? The first thing in favor of the Grateful Dead is that they led a movement of liberals in the direction of private organization and enthusiasm. This is truly no small thing – since by and large the recent movements of liberals have entailed shackling men with the chains of government coercion. These are, after all, people who jail dissidents on gay marriage and plot to extirpate soup kitchens and homeless shelters in order to enforce other deviant sexual orthodoxies. No, the Deadheads mostly carried on their business as private stoners, concert-goers and funlovers. Sure, they always voted Democrat (unless mercifully, on account of supererogatory indulgence of intoxicants, they failed to vote at all). But these bohemians mostly gave themselves over to a private venture — to a band that played great music, to a peculiar collection of enthusiasts. It was the pursuit of ever more Dead shows, and a deeper relation with Grateful Dead music and community, that animated them. Now, as indicated, “they” comprises a more varied lot than readers may anticipate. The whole thing cannot be explained by drugs and intoxication and dissolution. I have known more than a few Deadheads who will have no truck with any intoxicants beyond a couple beers or a glass of wine. Sober people do enjoy Grateful Dead songs. Garcia played a mean guitar and “Ripple” and “Casey Jones” are very fine songs. I myself, a Deadhead fellow-traveler you might say, have experience precisely concluding with what my home state has wisely or unwisely liberalized; while I know one Deadhead, now a blogger of renown with real verve in his pen, who was pleased many years ago to show up as among the precious few ROTC officers at Grateful Dead concerts; and who now abjures all but the very best bourbon, on worthy occasions. “The girls were fun,” he deadpans. Oh dear. Well, again I’ll state that liberals organizing a movement of Deadheads, whose energy, altogether innocent of government insinuation, built up a strange but ultimately impressive community of characters, deserve a hearty bid of praise. The aging basketball player and sports announcer Bill Walton shows his nearly 7-foot frame in many pictures from the Chicago shows. Ms. Ann Coulter, when she’s not emulating Joan D’Arc against alien PC conquest, enjoys listening to the Dead. In the end, rarely do our American liberals embrace anything that is not direct government dictation; but here they have done, and it’s not worth nothing. This principle – that creative power may inhere in private activity, rather than collective coercion, is not an idea that liberals often entertain. Now what of the delicate matter of lyrics of Grateful Dead songs? The best I’ll say is that they are pleasantly derivative. Mostly Americana adaptations mixed with superb improvisational instrumentation, they disclose an idiosyncratic but undeniable creative range. The Dead played many Bob Dylan songs, variations of classic blues, country, jazz, Southern rock, folk, and a collection of their own entrancing oddities. Sadly, they were not always sober enough to play well. But play well they could. On the whole the oeuvre speaks of a core of creative genius. Jerry Garcia led with his guitar and crank charisma. Addiction sunk him, but his songwriting achievements are evident. His voice was distinctive and his antic guitar magnificent. Deceased by dissipation in 1995, Garcia sounds like an Islamophobe mansplainer by today’s standards. The main thing that can be said in favor of the Grateful Dead is that they played great music. Not with notable consistency, but still observably; for a long period of time, the Grateful Dead were composing and performing some really excellent songs. I never saw a show (Garcia perished when I was a junior in high school) but I wish I had. Virtually the entire Grateful Dead audio archive is available for free. They made most performances public domain through the Library of Congress at Archive.org. Anyone can listen and examine it. No one is obligated to like the Grateful Dead. De gustibus non est disputandum. But no principle impels us to dislike them either. I say their musical virtues outweigh their social defects and I will go on enjoying the songs filling the air. Garcia learned to play the slide guitar more or less exclusively for the production of American Beauty, having never played it before but curious about its potential for the artistic direction the band was moving at that time. He later said that his brief dalliance with it was a revelation, and that he could have spent a lifetime mastering the instrument. Accordingly, there is not much virtuosity in his work with the slide on American Beauty, but the quality of the songwriting is such as to make you wonder what may have been had Garcia's attention been as focused on it as he wished. You describe their music as "pleasantly derivative." I like that. People sometimes wonder not only at the undeniable strain of excellence in popular music of the 1960's and 70s, but at how impossibly difficult it has been to recapture in the decades that followed. I would just venture that the musicians of that era were among the last to have real roots in the older traditions you mention, and the last whose influences were not almost exclusively "pop." Also, you mention that you were in junior high when Garcia died, and therefore did not see them in concert. This depresses me, since my last Grateful Dead show was during their summer tour of the year previous. Which means, in turn, that I really am getting on in years, having wasted and misspent my youth while your erudition and wisdom were on the increase. You have my sincere gratitude for commenting here, Sage. Two quick corrections: (1) Garcia died when I was "a junior in high school," e.i., 16-17 years old, not in junior high school. And (2) I said Grateful Dead lyrics, not their musical arrangements as a whole, were "pleasantly derivative." Two subtle distinctions that, shall we say, aging folks burning Colorado product and rocking to "U.S. Blues," likely could not perceive all that well; but important ones nonetheless. People sometimes wonder not only at the undeniable strain of excellence in popular music of the 1960's and 70s, but at how impossibly difficult it has been to recapture in the decades that followed. Sage, I have wondered about this too. I grew up in that span - call it the 20 years from 1955 to 1975 - that saw the birth of the new pop musical genre. At the time, I recall that only old fogies (i.e. people over age 40, being generous) actually preferred to listen to the music from the 30s and 40s, and that my generation listened to nothing but the new rock-n-roll. Also at the time, I assumed that some, perhaps much of the way young people were wholly taken by the genre was a generational thing - and that later generations would thus have their own new genres to which they were equally attached and looking with equal disdain at the prior music. What I find in my kids and their peers is NOT that, however. They continue to cotton to the music of the 60's and early 70's and recognize it (some, that is) as genuinely good and genuinely original, in a way that they do NOT cotton to later music, other than as good derivatively, good in the same ways as the earlier music was good, more or less: new instances of the same goods. There is no plausible replacement for the rock-n-roll era of music, at least so far. The flash-in-the-pan "movements" afterwards, or the limited-appeal musics, like disco, punk, rap, etc neither have enough in the way of originality to replace, nor have enough goodness in them to last, I think. My tentative conclusion is that the popularity of what was then the new rock music was not simply generational, and that the movement did generate something with more lasting reality than the merely fashionable emperor's new clothes of a few years. They seem to have done something more along the lines of the development from baroque into classical in the 1700s. (Not, by any means, implying that musical form "rock" is as deeply beautiful as classical, speaking only to the degree of change, of newness.) If so, it should not be surprising that those who come after have difficulty in capturing the same level of originality. Paul, what's pitiful is that I read the "junior in high school" passage more than once to be sure I'd read it correctly, and still got it wrong. It would have been better to have left my heart in San Francisco, than to have left my mind in RFK Stadium, but here we are. Thank you for the correction--I am impressed by your insight. The Dead's lyrics have always seemed to me to have a certain recycled, not to say repetitive, quality that you describe very well. You might even say something similar about many of the songs of Townes Van Zandt, who was among America's all-time great lyricists, and about whom I've considered posting before. Tony, I agree completely with your comment and it seems to me that the genres you mention (like punk) represent, in their individual ways, a profound regression toward the primitive. That is not something I would say about the "psychedelic blues" movement, which seems to me to have been a genuine development of the older form. You wrote this nearly a year ago and that is also about the last time we had a post dedicated to music. Please, this is truly far too long to go without. However you decide for the future, I wish to share an excessive number of song links to help fill the air. In order to circumvent the filter I'm going to delete the first "w" at the beginning of each link, simply add it in your browser to have the video appear. Rock-n-roll represents the last bit of culturally unified music. It arose largely coincidentally with the simultaneous rise of first-generation electronic instruments and cheap popular play-back media (45 rpm records). After that, popular music began to fracture, socially,along lines of race and ethnicity, fueled by the manufactured genres of the record companies -oh, and the lure of easy money. Musical aesthetics for popular music makes about as much sense as TV series, Twin Peaks. P. S. Many people still liked swing in the 1960's. It was the last popular music with a unified style based on authentic historical roots. Rock-n-roll, while borrowing some elements, is really a type of cyborg music - half man/half electronic. True musical connectivity continued, and still does, with folk music. A year later but I want to call attention to an excellent Amazon production called "Long Strange Trip"; well done and unstinting, worth a watch if you like the Dead.